You know all about busy during the Holiday season. There's a lot to do! There are presents to wrap, stockings to stuff. You not only have to find a tree to trim but you've got to trim it as well! That's not to mention the activities leading up to the family affair. There are the baked goods that need baking for the marching band fundraiser, the random knick-knacks to gather for your office Secret Santa, and Christmas concerts to attend. So, with all this exhausting activity, wouldn't it be nice to have your own little holiday elf around the house? They could add an extra sparkle to your Christmas cookies, nicely make sure Fido doesn't eat the popcorn chains for the tree, and curl those ribbons on top of the presents just right. Yep, it would be great to have a helper around and it turns out, you don't even need to contact Santa to ask him to send help! 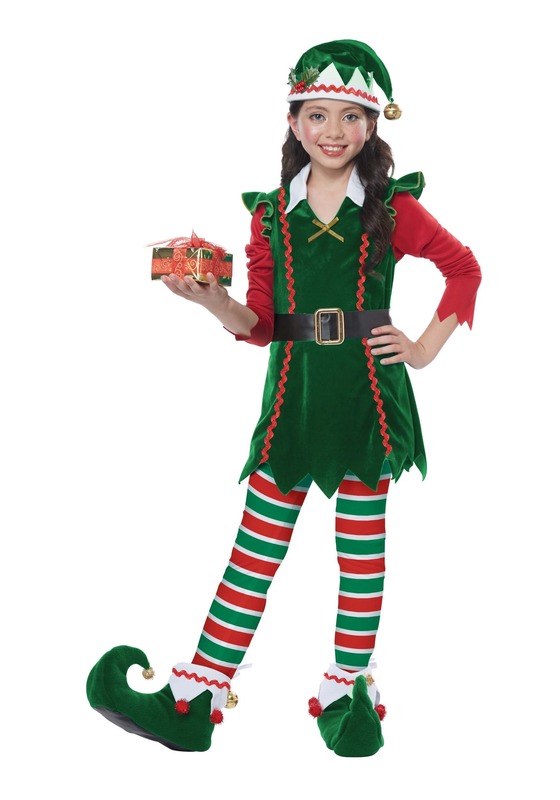 This adorable elf suit will not only help your little one get into the holiday spirit, she might also want to help prepare for the holidays! The tunic is green and red with a velvet texture and red bric-a-brac down the front. Your little one will love the ruffles around the red sleeves and the floppy green hat with a bell on the tip. The leggings are sweet and candy-striped and will look swell with curved slippers. So, it's time to kick this holiday into gear! You and your little elf are sure to make a great team! Who knew that so many pine boughs fit along your banisters? Who knew that there were so many Christmas songs to put on the most festive playlist ever? The air in your house smells so strongly of ginger and cinnamon that you've got to wonder if it will ever be humdrum again. Well, that's just what happens when you've got an elf in the house!